NYCDailyDeals -- What's Free And Cheap In New York City Today: $1 Pizza Slices On The L.E.S. $1 Pizza Slices On The L.E.S. Although we've tracked down some of NYC's best pizza places with $1 slices before, we thought we'd let you know about Mario's Pizza which just opened on the Lower East Side (corner of Eldridge Street and Houston Street). 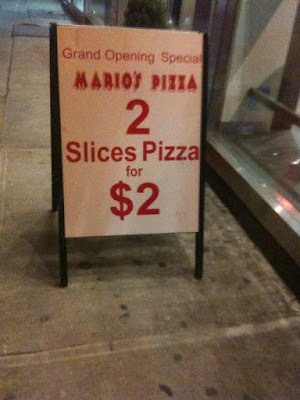 For a limited time, they're selling 2 slices of pizza for $2. Normally, a single slice will run you $2.29. No better way to help that morning hangover! Dine In Brooklyn For Cheap! Free Pinkberry Tonight @ All Locations!